I have family all over the world and also all over the UK. Family is very important to me and I would love to see more of them and they want to see more of the girls growing up. This often involves lengthy emails with pictures attached or pictures shared on other social networking platforms. I am careful however about the pictures I place on these and its not the same as having an album to store all our pictures and videos of the girls as they grow up that family and close friends can view. 23Snaps is a private social networking tool which lets you capture, cherish and share the special moments in your child's life. I was particularly excited to use this as, as previously mentioned, it would be great to share our photos and videos with our widely spread family. The application is free to download which is a great bonus and currently available for iPhone and iPad with the Android app due for release next week. There is also the online web version which is again free to use. 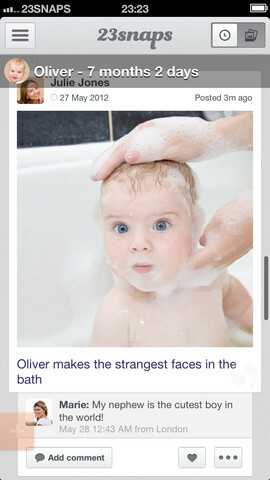 One of the features that I particularly like is that you create each of your children their own page. On this page you can look at photos or videos, which are displayed in pin style, in chronological order. You are able to enter a text update, so for example when they take their first steps or their first tooth can be recorded. The thing I really like within this is the function to enter a measurement such as height or weight. I'm often asked how much did she weigh when she was 6 months and now I can find out. 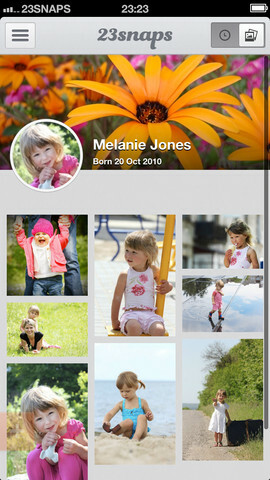 The app is smart enough to work out each child's age to month and day and so when a photo is entered it displays this data along with the date on each picture. You are therefore able to create for each of your own children a personalised story of their childhood. Family and close friends can comment on your pictures enabling a sense of 'being there' even when far away. This functionality alone is brilliant; my family can see at a glance all the key milestones of my children's development and see how they are growing. There is no more guessing how old was she at Christmas, at what age did she take her first step, its all there for us to see at a glance. I found the application very easy to navigate through and easy to use. There is a news feed which shows as it would suggest a collection of what has happened, again in chronological order. It was great to see the removal of duplication as I could enter my husband and the application records him as my partner, enabling us both to edit our children's pages. You also have the option of viewing the news feed in calender mode, so if like me you have taken a picture of your children almost every day, you can see throughout the month how they have changed. I absolutely love this application my family have already started using it and there is not much more I can say about it other than to try it yourself, its free and its a fantastic way to cherish those moments that go all too quickly.